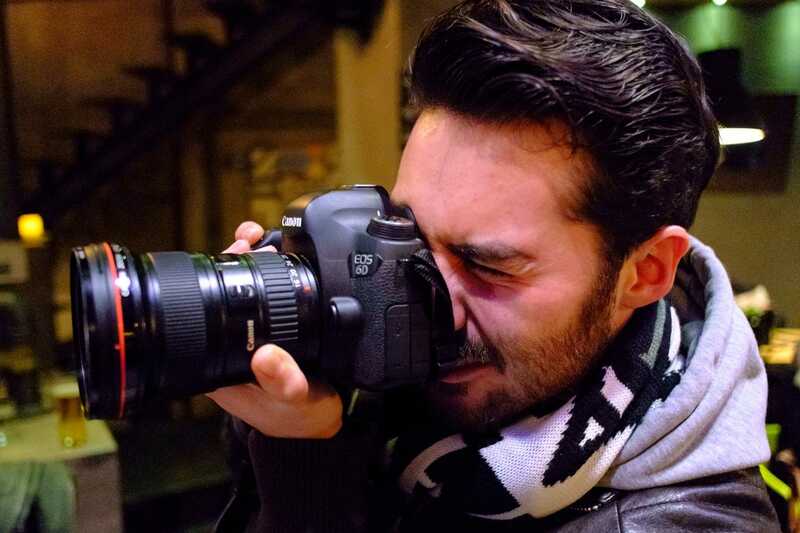 At Street Hunters we like to review gear for our readers so you can get an idea of how gear performs and if it might work well for you and your style of photography. 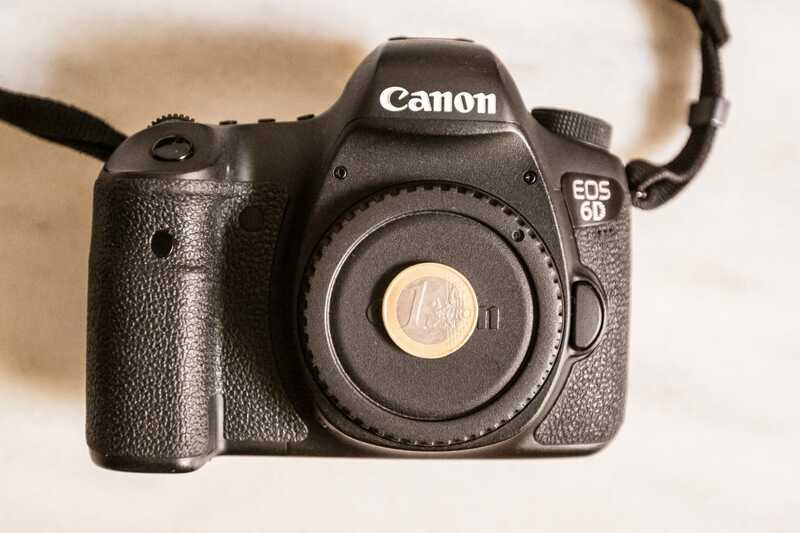 In this review I will analyse my own Canon EOS 6D, to tell you my experiences with using this camera. Being a DSLR camera, the 6D isn’t a type of camera most well known for street photography. However, DSLRs are incredibly versatile cameras and many people may have bought them for a wide variety of uses, and will want to apply them to street photography. Equally some photographers will be using them to photograph for their business (perhaps weddings, or sports), and then also using the same camera to pursue street photography as their hobby. For some reasons as to why a DSLR is good for street photography, check out Rob Heron’s Guide to Using A DSLR for Street Photography. This review will focus on using the Canon EOS 6D 20MP DSLR as a street photography camera. The review is based on my own experiences with using the Canon extensively over the course of almost 2 years. 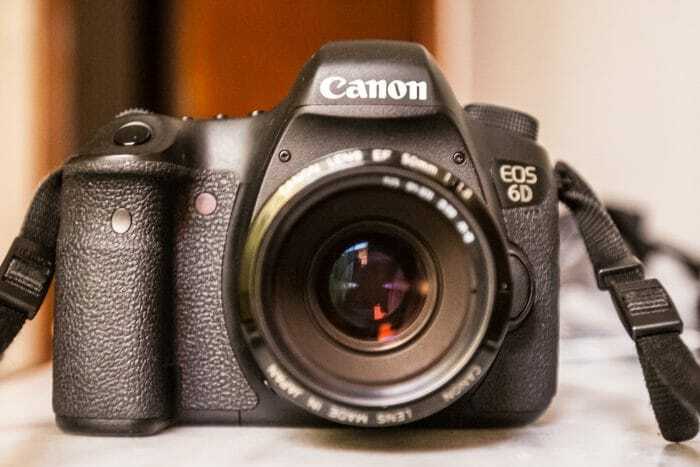 I have used the 6D for several different styles of photography in this time, but as we are street photographers here at street hunters, I’m only going to analyse the Canon 6D as a street photography camera. Because of the huge choice of lenses available for Canon DSLRS, and their vastly different performances and characteristics, I will review the camera body only, and will examine specific Canon fit lenses for street photography in later reviews. So read on for a detailed review of the Canon EOS 6D as a street photography camera. DSLRs are not well known as ‘specialist’ street photography cameras, and much of that is down to the fact that they are larger and heavier than many compact, mirrorless and rangefinder style cameras. Single Lens Reflex cameras haven’t always been as large as they are now – the fully manual cameras of the 1960s and 1970s were marvelously small and low-key. The arrival of more complex and powerful autofocus systems in the 1980s made SLRs balloon in size, and DSLRs have largely continued this trend. The EOS 6D is no exception. As a full frame DSLR it needs a large mirror box and pentaprism, as well as a large flange distance between the back of the lens and the sensor. This doesn’t help to make it a compact camera for street photography. To further exacerbate the problem, modern full frame sensors have such a high resolving power that lots of the high-end large aperture lenses (particularly the zooms) are also big and heavy, because they contain many large pieces of glass. Canon’s f/2.8 wide angle and standard zoom lenses for instance now use an end element with a huge 82mm diameter! The good news though, is that prime lenses are excellent for street photography, and with careful selection there are still some brilliantly compact lenses to be found, like Canon’s 50mm f/1.8 and 40mm f/2.8, which aren’t too large or conspicuous. The Canon 6D measures approximately 144.5 x 110.5 x 71.2mm (5.7 x 4.4 x 2.8”) and weighs in at 770 g. As a comparison, the full frame Leica M measures 139 x 80 x 42mm, and weighs almost 100g less, which gives you some idea as to how large the Canon is a street camera. The 6D is smaller than Canon’s other full frame DSLRs though, being a little more compact than the 5D, and significantly smaller than the 1DX with its built in battery grip, that is a true monster for street photography. In the full frame DSLR arena then, the 6D is as small and compact as it gets. I think when paired with a very small prime lens it makes a nice camera for street photography, but not one which you can slip into a pocket. The Canon 6D is very well built, with a magnesium alloy body and a polycarbonate top plate. It feels solid, and not at all cheap or flimsy. You can be sure it will stand up to years of street photography use. I’ve been using my camera heavily for almost 2 years now, so much so that I’ve now worn through some of the paint finish on the base of the camera, as you can see from the photo. This is the only real sign of wear on the camera, which I find very impressive. I must have walked miles and miles on the street with this thing hanging from my shoulder! The 6D also offers an element of weather sealing too, with dust and drip protection seals around the buttons. So provided it’s looked after, the 6D can withstand some exposure to the elements that street photography throws at it! You shouldn’t expect it to be fully waterproof though, so always pack an umbrella if the weather looks ominous! The only way to improve the build quality of the 6D for street photography would be to offer a greater level of weather and waterproofing as found in some of the Pentax cameras. I love the layout of Canon’s higher end DSLRs, and the 6D is no exception. There is a mode dial on the top left of the camera that allows you to easily switch between Manual, Aperture Priority, Shutter Priority and other modes. On the right of the camera the user can set aperture and shutter with wheels on the back and the top of the camera respectively, as well as alter ISO, AF, and metering modes. AF points can be selected using a combination of a thumb button press, and the rear d-pad or top wheel – you don’t need to move your eye from the viewfinder for this, or change your grip. This means all the regular shooting functions on the camera can be operated with the right hand, which makes the Canon a fast and easy-to-use camera on the street. 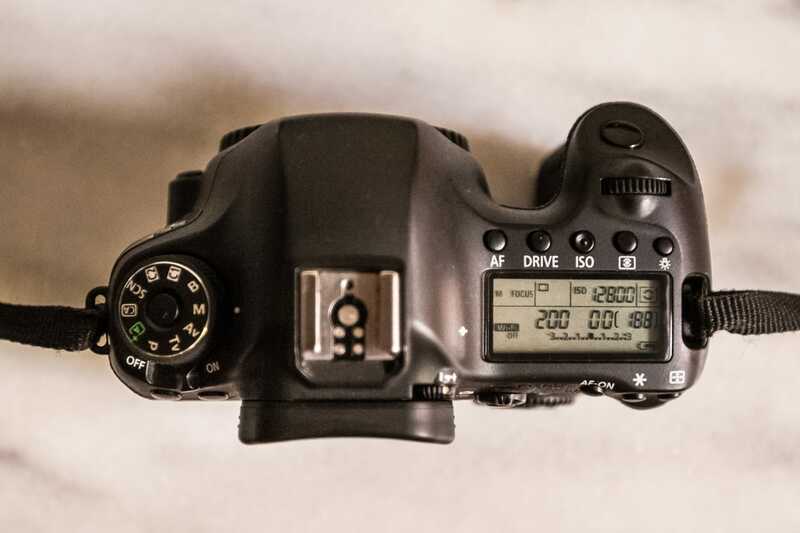 There is also an extra LCD on the top of the camera to display basic exposure and settings, so the camera can be primed with the right set up before a shot. The 3.0” LCD on the back of the camera is bright and clear, and Canon’s menu is simple and well designed. You can navigate the menu via a mix of the two dials and the d-pad directional joystick built into the rear dial. There’s a custom menu page where you can assign regularly used menu functions for quick access, such as LCD brightness. You can also customise some of the button functions, swapping them around to suit your individual needs. The optical viewfinder in the Canon 6D is fantastic – it’s very bright and clear, and a huge step up from Canon’s APS-C DSLRs. The autofocus points are always displayed inside the viewfinder, but they don’t get in the way of shooting as they are grouped around the centre of the display. Across the bottom of the viewfinder are readings for battery level, shutter speed, aperture, exposure, and ISO, as well as some extra information. Users of mirrorless systems with EVF viewfinders may be left a little disappointed with the 6D’s OVF – while you can customise some of what’s displayed in the OVF (such as a horizon level), there is nowhere near the level of customization or flexibility offered by an EVF. And of course, no way to display focus peaking, or review images within the viewfinder. Ditto, unlike a rangefinder camera you aren’t able to see anything outside the frame, which may frustrate some street photographers. Personally I don’t mind these drawbacks, I adore the OVF in the 6D, I love seeing exactly what my lens does, and I’m yet to be significantly impressed by EVFs. If I need to see what’s going to appear in my frame (maybe to catch a person walking into the frame) I just open my left eye, keeping my right to the viewfinder. Likewise, for more flexible shooting I can just press the live view button with my thumb and compose using the rear LCD. In an ideal world the 6D’s rear LCD would tilt too for easy composition for “rat’s eye shooting”. All in all then, I think the Canon handles almost flawlessly, as the OVF vs EVF issue is largely down to personal preference. The Canon performs well for street photography. The 6D’s AF system is much maligned in other ‘general’ reviews, as it only has 11 AF points compared to the more expensive 5D MkIII’s 61 points, and the 39 AF points of the equivalent Nikon D610. But for street photography I don’t find this to be a problem, 11 AF points are more than enough, and it’s so easy to switch between them using a combination of buttons and the rear d-pad. The focusing speed is good, although the speed and the camera’s ability to focus are dependent on the lenses you use. My Canon L series 16-35 focuses much faster than my 28 year old 50mm prime for instance. The centre AF point in the 6D is very powerful, and can focus in extremely low light which is great for night street photography. So as far as AF is concerned the 6D is a good street photography camera. When it comes to manual focusing though, the 6D is not exactly ideally suited. The OVF is designed around the AF system, so lacks a brilliantly useful split prism as found in older manual SLRs for easy and fast manual focusing. It also lacks focus peaking as you would find in a mirrorless camera with EVF. However, for pure speed in manual focus street photography I like to use the zone focusing technique, as I can set my camera and lens focus and then just worry about composing and catching my shot. You can read our guide to zone focusing in street photography to learn how to do this for yourself. 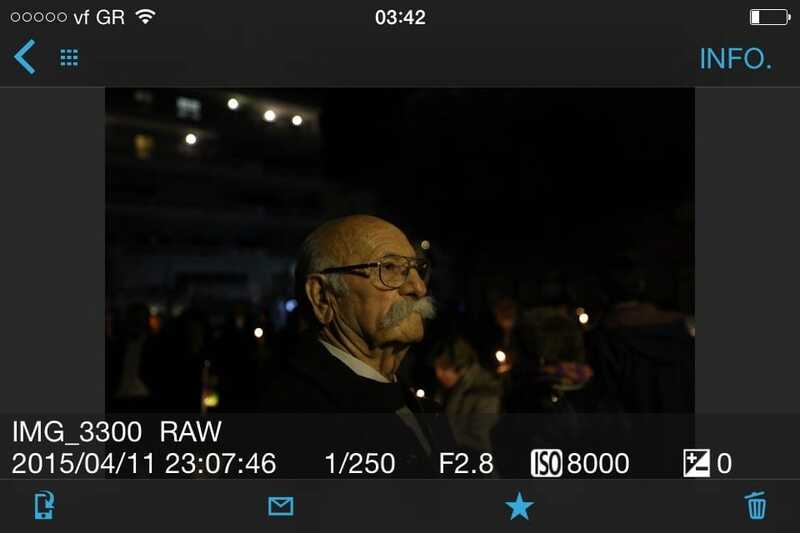 When employing this method, the lack of a split prism viewfinder isn’t a big problem for street photography with my 6D. 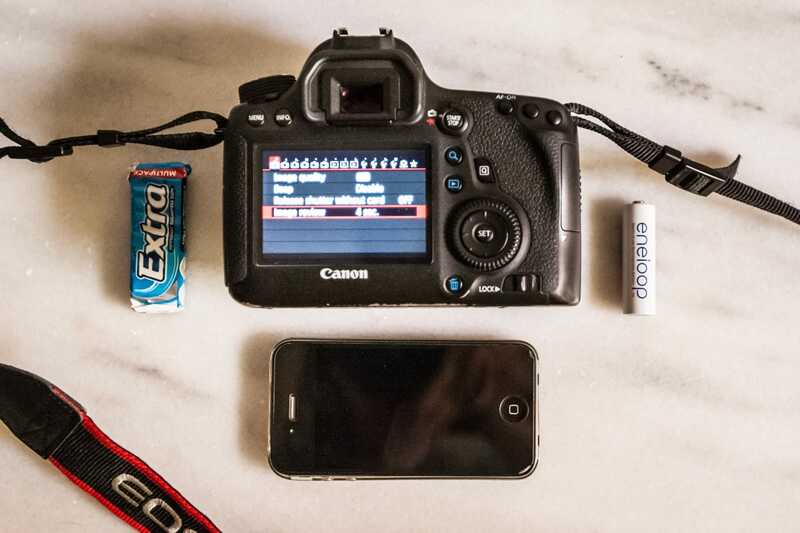 The battery life on the 6D is excellent thanks to its OVF and mechanical shutter. The battery packs I’ve been using in the camera are now almost two years old (so their charge capacity has depleted) but I still find a battery lasts around 600-800 shots in normal use. The rear LCD is the main power draw for the battery, and this can be manually configured to remain off even after taking a photo, if battery life is really of a great concern and you’re planning on taking a massive number of shots. I don’t remember ever exhausting a fully charged battery over the course of a day’s shooting, so the chances are “your batteries” will give out sooner than the 6D’s. The 6D has several features that make it a very useful street photography camera. As I have already mentioned the ability to customise the menu and some button configurations really helps to make it handle well, and exactly to my liking. There are also several AF and metering mode options, and the ability to hold and release exposure with just one button. It is also possible to separate focusing from the shutter release button, so you can autofocus using the ‘back button’ focusing system. The 6D also has an auto ISO feature, where you can customise the minimum shutter speed to use and the camera will adjust the ISO automatically to keep it as low as possible for a perfect exposure. 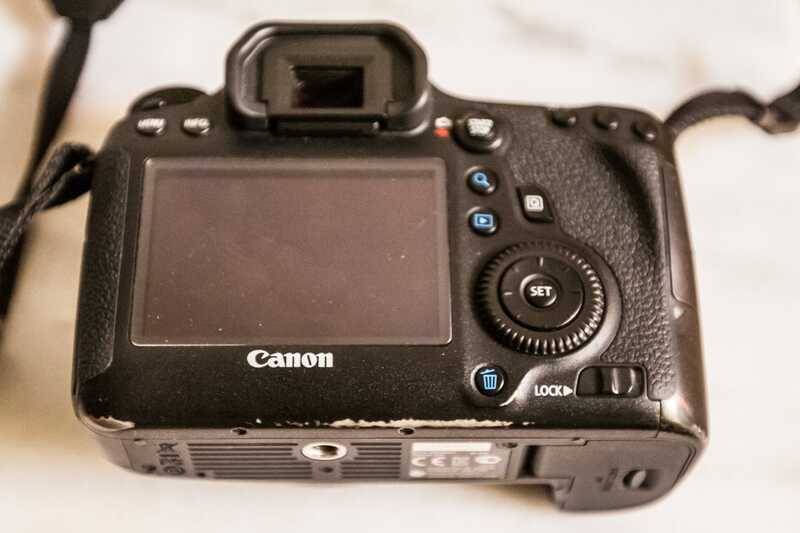 There is also a good ‘silent shutter’ feature, which damps down the release of the mirror and shutter to make the camera much quieter than it would otherwise be. This does add a little lag to shooting, but you soon get used to it. It doesn’t make the camera totally silent when you take a photo, but it is useful on a quiet street if you want to be subtle with your shooting. The Canon 6D also has two features often found in smartphones – these are built in GPS and WiFi. I must confess I haven’t used the GPS feature lots, but it does seem to work quite well. I imagine it could be of great use shooting in an unfamiliar city if you wanted to tag your shots with a location to make a street hunt ‘map’. I have used the 6D’s WiFi lots though, and it really is a useful feature. In a world where more and more street photographers want to share their work online, it’s great to be able to download your photos straight from the camera to a smartphone or tablet and edit or upload them on the go. 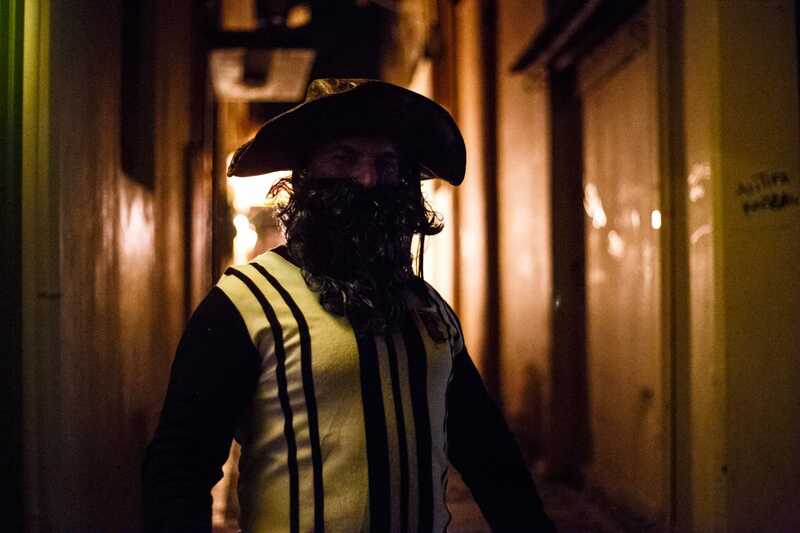 In fact, with the 6D you can adopt a fully mobile workflow, and you can read about Edward Conde’s mobile darkroom setup in his guide to Using an iPad with Street Hunting. You can even use a smartphone or tablet to fire the camera remotely, with the device displaying a live feed from camera. I’ve found this to be a slightly convoluted and clumsy way of shooting though. The Canon absolutely excels in low light, making it a phenomenal tool if low light street photography is your forte. The 6D exhibits barely any noise at all at ISO 6400, and ISO 10,000 is extremely clean. You can even get useable shots at an ISO of 25,600 in colour, which is truly extraordinary. With the right exposure and the right kind of shot, you can make great black and white photos at ISOs 51,200 and 102,400. It’s worth bearing in mind too that I view my 6D photos on a high-resolution ‘retina’ screen on a MacBook, which leaves very little room for anything other than a very clean image. Any noise that is displayed in the 6D’s files is rendered in a very nice filmic way, owing to the way the full frame sensor is designed. This camera really is a low light monster, which is why I think it deserves a perfect score here. The files the 6D produces are absolutely beautiful, thanks to its fantastic 35mm sized sensor. With a sensor this large, you have to remember that photos will be more sensitive to camera shake, especially as digital sensors now produce such sharp images. Similarly, at large apertures, a ‘larger’ full frame sensor will produce a much shallower depth of field than APS-C or micro 4/3s sensors would with an equivalent aperture, making achieving accurate focus all the more important. A sensor as good as the 6D’s is really rewarded with a good quality lens, like a nice prime, though you can get some good shots using a more average lens stopped down. As far as image quality for street shots goes, the 6D is almost as good as it gets. I can only think that a Leica or a full frame Nikon or Sony with the greater dynamic range of the newer Sony sensors will surpass it for image quality as a street photography camera. The Canon 6D is far from being a cheap camera: the body only retails for £1,150 on Amazon.co.uk, $1,400 on Amazon US, and costs €1,400 throughout Europe. Fortunately, being a Canon DSLR, there is a huge back catalogue of lenses and accessories to choose from for this camera, many of which can be obtained very reasonably. Not only are there a great selection of good third party lenses in the Canon EF mount, but Canon itself offers two well priced primes ideal for street photography in the shape of their 50mm f/1.8 and 40mm f/2.8. The great advantage with Canon though is that the brand’s popularity with both professional and amateur DSLR photographers means that there is a huge range of used lenses and accessories to choose from – if you hunt around there are bargains to be had. Likewise, if you want to ‘upgrade’, or buy and swap your lenses you can be fairly confident of finding a used market for them, such is the ubiquity of Canon’s EF mount. When you begin to consider the Canon against its full frame competitors it actually represents quite good value. Nikon’s full frame equivalent (the D610) is around the same price, while Sony’s A7R and A7S full frame mirrorless offerings cost £250 and £450 more respectively. The elephant in the room for the Canon 6D is the presence of the now superseded (though still on sale) Sony A7, which now sells for £300 less than the Canon. The A7 sports a full frame sensor in a much smaller body than the Canon, and is a more than worthy rival to it. The only significant ‘black mark’ against the Sony is the smaller catalogue of lenses to choose from for the E-Mount compared to Canon’s EF mount, though adapters can be used to fit other lenses to the Sony, but AF performance will suffer. I hope to be able to able to test one of Sony A7 range for street photography at some point in the future, and I really feel Sony should be commended for shaking up the market for interchangeable lens full frame cameras. The replacement for the A7, the A7II, costs £250 more than the Canon 6D, and includes in-body image stabilisation. Canon’s next full frame DSLR camera, the 5D MkIII, sells for around £800-$1000 more than the 6D. Against these cameras then, the 6D represents a ‘decent value’ entry into the full frame world especially considering the freedom to change lenses, and a great back catalogue of lenses to choose from, though the A7’s current price means it’s no longer the cheapest full frame camera with swappable lenses. It’s also important to remember that as a DSLR the Canon offers lots of flexibility, allowing a photographer to use one body for all sorts of applications. For me personally, there is a lot to be said for this flexibility. I think the Canon 6D makes a great street photography camera, although with some caveats. It is not by any means a small camera, so its effectiveness as a street camera depends entirely on teaming it with a lens that is as small and inconspicuous as possible. I have shot thousands of street photos with the 6D and the large Canon 16-35 lens as it’s my favourite lens, but it makes for a very intimidating and challenging combination, and one that will limit what kind of photos you can make. It will also probably get you shouted at – I’ve experienced this several times! In terms of ‘technical’ quality though, the images this combination will make are superb. But to really make this camera into one that will allow you to move through the streets effortlessly, and to compose freely and get close to your subjects, the 6D needs to be combined with a really small prime lens. At the moment I’m using Canon’s small 50mm f/1.8 prime, which is a nice low-key lens. In the future I’m hoping to test the Canon 40mm pancake lens on the 6D, as I think this will be the perfect combination for a street photography set up. Using this camera for street photography then is all about compromise. You have to accept that you’re using a general-purpose tool designed to produce incredible images, but one that is not specifically designed to be an unobtrusive street photography camera. If you can deal with the ‘relative’ size and bulk of the 6D, and keep the lens you use on the street as small as possible, you’re left with a superb camera that’s going to produce some beautiful street photography images, as well as offering insane high ISO performance that will allow you to get low light shots which you would never have thought possible. I love this camera – I think it’s a beautifully made tool which I have utter confidence will perform exactly as I want it to whatever the crazy world of the streets throws at it! Do you want to buy the Canon EOS 6D? Buy the CANON EOS 6D 20.2 Megapixel Digital SLR Camera (Body Only) / 8035B002 / on Amazon.com. Buy the Canon EOS 6D Digital SLR Camera with EF 40mm 2.8 STM Lens (20.2MP, CMOS sensor, 10x Optical Zoom) on Amazon.co.uk. The 6D is a great choice of camera for those who want a camera that they can use for many types of photography as well as street photography. Those who only shoot street, and those searching for a ‘pure’ street photography camera designed for this purpose, and this purpose alone, should perhaps look elsewhere though. For manual focusing I can not recommend the EG-S focusing screen enough. With that I almost instantly nail the focus with my manual lenses. Thanks for the recommendation cschlipf! I have not used the EG-S screen myself so I didn’t want to comment on its effectiveness, but I’m glad to hear it’s so good. I think I will consider picking one up at some point. Did you find it difficult to fit? Cheers! i am using 6D + 40mm f/2.8 pancake combination since august 2013 continuously. I don’t have any other lens. I used a 28-135mm, but sold after 6 months of use as i got bored with it, due to its compromised image quality, lack of sharpness, which is found satisfactorily in 40mm. I don’t want confusion of having to choose between 2-3-4-5 lenses, as lesser the lenses, the better. In the past i had 6 lenses with nikon dslr, but i sold the whole set in favor of the current combo and i am happy. It is good enough for a lifetime of documenting action & life happening on the streets. For portraits, 40mm is not a good lens at all, as i know from experience. We need a wide zoom like 16-35 (but very heavy & voluble) for street & a tele prime like 85mm f/1.8 or 135mm f/2 for portraits. For head-shots best lens is the 300mm f/2.8 but it is very expensive, & even a 300mm f/4 or 400mm f/5.6 or a 100-400mm II would suffice as cheap alternative. I would have loved if my pancake was one stop faster, as f/2 is good aperture, and f/1.4 is only needed for that extra & impossible 5% shots that we may miss in extreme low light & low contrast conditions, i.e. for nocturnal purposes. And in any case, for street, Zone focusing is ideal method, which employs f/8 or f/11 aperture with the distance set at to 2 or 3 meters in Manual focus mode. We can also use ISO 800 on sunny afternoon, 1600 on shady situations, and 3200 in evening to stop action, i.e. avoid blurs, as the shutter speed will remain high due to high ISO. The best lens today, for 6D, to shoot on streets is not any big-heavy fast prime or zoom, but 40mm, the next best option is the 35mm f/2 non-IS, but it is old technology and less sharp than 40mm. The 50mm f/1.8 has plastic feel to it, so, i dislike it completely even though it is fast and OK image-wise, but still, not as good as 40mm. Build-quality of 40mm is instantly felt due to its solid tactile feel. The No.1 value-for-money lens in Canon line-up has to be the 40mm, not 50 nifty fifty. Nothing on earth replaces this lens for a canon full-frame body especially for street, & even nikon don’t make such small lenses. 6D is a ergonomically good body as there are no buttons on the left side. This is a plus, bonus, gift from Canon. I don’t like the complicated menus of 5D, and 6D is so simple & basic. For street, it is a boon, being the smallest fullframe body. Leica M & M-P Rangefinders are the best system currently, but out of reach of most due to exorbitant pricing, but deservedly so, as they are most accurate & mechanically perfect instruments or apparatus. Medium Format is again costly affair. Fuji X100T is another cheap great option (poor man’s leica), but non-interchangeable. Thank you for your detailed comment Chirag. I must say I really lust after the 40mm pancake lens, and I hope it is the next lens I can acquire. I have read mixed reviews of the autofocus performance – what are your feelings? I am fond of the Canon 50mm f/1.8 – mine is the MkI model, with the metal lens mount, as well as having a distance scale display which was removed from the MkII model. The AF performance on my MkI 50mm isn’t amazing, I’ve borrowed a MkII and found the AF to be marginally better but still not brilliant. The images both lenses produce for the price though, are amazing, so I’d like to keep the 50mm in my bag for low light and hopefully team it with the 40mm in the future! I also own the 28-135 lens, which I originally had on a 20D. I’ve used it on the 6D, but like you, I would rate it as good to ok, particularly wide open. Stopped down on the 6D has produced some nice results with post-processing, but it is not an ideal lens for the street. And for rangefinder-style cameras don’t forgot the Fuji X-Pro, which seems to be quite a popular street photography camera. Thank you for your comments on lenses, enjoy your street photography! Thanks Digby, The time i spent with 40mm tells me that it has slightly slow AF for comfort, and i tend to feel a little annoyed at times, yes of course in zone focusing (esp. for street) there’s no need to use AF, but sometimes we may like to use it on streets too. However, certainly, AF is a tad bit on the slower side, the only disappointing thing that can be said about it in criticism. The best thing is that there’s no such offering from nikon, as far as 40mm focal-length is concerned. Whoever feels that 35 is a bit wide and 50 a little narrow or cramping for room, will like the 40. Then we don’t need those two focal lengths, as the “in-between” option of 40mm will replace the other two. Minimalistic Mindset goes a long way in making good pictures. Yes, the ever-green 50 can’t be forgotten as it has less distortion than 40, thus much better for over-all use, including portraits. 40 feels very awkward for portraits, really. The limitation with 3:2 aspect-ratio format is that only a slightly mid-telephoto lens like 50 is needed for one-subject portrait. 40mm is closest to being called a perfectly normal lens as the diagonal measurement of sensor is 43mm. A 45mm TS-E lens is another such normal lens with natural perspective, & without distortion. Despite being normal, 40mm has distortion, when it is not supposed to have it in the first place. Only wide lens have it, not normal, but Dslrs have rectangle sensor, so it is not possible to make a non-distorting normal lens. At 135mm the distortion is near Zero and gone by 200mm till 300mm, and again at 400mm it starts to creep in. So, best focal-length for portraits is 135 to 400mm. Whereas a square aspect ratio cameras – like Large Format (Sinar Cameras) – can have a normal lens without distortion, but that format is no more in common practical use, except for some serious studio work like Product photography etc. Personally, even if it may sound boring, i would accept Square Format more easily than rectangle sensors as it may give a balanced perspective, also, we can have room for cropping the unpleasant elements out of the photo. 3:2 is weird for portraits as it is too long laterally. 5:4 format would be great, as it is next to square in shape. In fact it is called the Professional Portrait Format by some. Nikon D810 has a Cropped 5:4 Mode, which can be used for portrait. Even for landscapes, it is a myth that only a wide rectangle image looks good. Square Landscape may look appealing to many. I know that all our PC LED Monitors are no more in square form, but are made as wide as possible. It is getting wider and wider by the day. It is said, our eyes like to see wide more than in squares. Yes, our eyes see in rectangle, but it is due to the fact that we have 2 eyes & that too placed side-by-side. So, the merged 3D image formed in the brain is horizontally rectangular, at the same time non-distorting. While, in a dslr, the image formed is from a single-lens. We see wide with the help of 2 eyes. Camera has to produce wide image with just one lens. Our one eye doesn’t see wide, rather squarish. Our Binocular Vision is Wide. There’s one way to make non-distorting images – using Tilt-Shift lenses ; or by stitching 2 images taken with 17mm TS-E lens to get widest possible panoramic non-distorting image. Again, how many people can afford the luxury of a TS-E lens ? Also, i am sure the metal-mount mark-1 model of 50mm would be well-built as you say so. Some Old-Gold Lenses beat the new lenses for the Vintage-Value & solid-feel (leica-like or zeiss-like), with features like aperture-ring, or distance-scale, that isn’t the case anymore, to reduce the cost of making lenses, as also, to make more profits. Yes, X-Pro II is one of the most eagerly awaited bodies, as the 1st model launched in 2012 faced slow AF issues. Then there is Sony A7-II + Loxia Zeiss 35mm f/2 Manual focus lens (new) – a nice combo, just that A7 series don’t have Optical Viewfinder, and most people don’t like Electronic VF. Secondly, Sony’s colors are not like Canon or Nikon, as sony is not a Camera / Optical / Imaging Company, but Electronics & Music company. Though it makes sensors for all 3 Medium Format Cameras like Phase One, Hasselblad, Pentax 645Z, it won’t be in the reckoning for me. I may buy cameras with sony sensors, but not sony camera itself ; & who knows what’s going to happen tomorrow. Even i may end-up buying it. Correct me wherever you have found me wanting in my assessment of lenses & focal-length, so that i can get more & more enlightened in the process. After all life is a process. Thanks for allowing me here. I really love my sweety 6D. And for now, I go with 24-105 lense! hehe! Cheers Emerty. The 6D is crazy in low light, using it has totally changed how I can shoot at night now. I like how you refer to it as a sweetie – it is just that bit smaller than a 5D which to me makes all the difference – the 6D fits my hand perfectly! Have fun with the 24-105L, it is a very popular lens, and enjoy your street shooting with the 6D!! I shoot street with the 6D (and usually 24-105mm). I find this offers flexibility with composition and because the camera is large for ‘street’ also allows for some space from the ‘subject’. One bonus I find for the larger body and lens is that you often look like a tourist which can help with blending in. As for the body, in Chile last year while street shooting I had the 6D snatched, I gave chase and after a while he panicked and threw the camera, it crashed onto the sidewalk, and yet after, worked like the day I bought it. Thanks for the comment Sharon! I find what you say about ‘space from subject’ very interesting. I’m currently trying to force myself to use wider lenses to really push myself in my shooting and composition – it’s not natural to bring your camera close to a stranger but I feel it’s something I must overcome to make my work better. 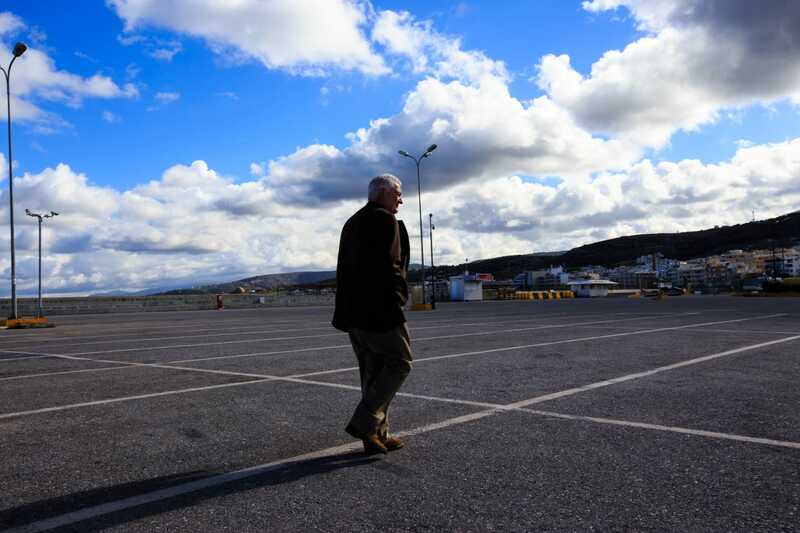 I agree on the ‘looking like a tourist’ thing – street photography is much easier in the Greece in the summer as there are loads of tourists about toting DSLRs. The incident in Chile sounds dramatic, relieved to hear you got your camera back and that it survived the ordeal. I’d like to visit Chile sometime as I studied it a little while at uni. Daz – I couldn’t agree more, versatility and adaptability really is the trump card of a DSLR, though, like you, sometimes I just wish for a smaller camera. I have realised though that this is something I need to get over in some cases, much of getting good street photography shots is about confidence and attitude, and the camera’s size isn’t actually really holding me back at all! Love the ‘white statue’ photo mate. Thanks for commenting! I love my 6D. Havent tried it for Street Photography yet though. Im been using my Song a6000 so far but its not very good for low light. 6D is the King of Low Light, for its price range. Will have to check out the 40mm lens for sure. salsaguy, sounds like you have an immense street photography camera there in the a6000, I’m surprised to hear you say it’s not good in low light. That said though, the 6D is immense, so it’s set a very high standard there! I would be interested to hear how you get on with the 40mm pancake if you add one to your collection. one more thing, i agree with you that 24-50mm focal length is best suited for Street, best being the 28mm f/1.8 lens and another 50mm – for a two-lens set-up. Or if we want to retain just one lens, it could be 35 or 40mm. There are numerous permutations & combination, depending on our likes, or dislikes. 28 comes more naturally to me, personally, more than 35 or 40. Actually 35 or 40mm is a boring focal-length, being Normal or close to it. I like to deviate from the set-standards. Neither is 28 normal, nor the 50 is normal. One is slightly wide, other is slightly tele. So, i like both of them, but nothing in between. A 24-70mm f/2.8 lens would be convenient as it would include all useful focal-lengths : 24, 28, 35, 40, 45, 50, & even 70 ; but it is big, heavy, expensive lens. So, a prime is supreme. Ricoh GR is the lightest camera weighing just 210 grams, with aps-c sensor, and not very pricy, has a 28mm f/2.8 equivalent lens, terrific image quality. If we want to use two focal lengths on street, we may have one Ricoh GR, & another 6D + 50mm ; carrying 2 bodies made very easy. Or just a 28mm f/1.8 on 6D, and carrying another 50mm in jacket, pocket, bag. Sigma 35mm f/1.4 Art series lens is too bulky, but with highest ratings in its class or otherwise. So, endless options in market for us, very very confusing, we are spoiled for choices. Digby, here, i would require you to intervene and share some tips from your experience with different focal lengths etc…. thanks. It’s a pleasure talking to you. Chirag – yes I agree lens choice is very confusing, mainly because lenses always require some kind of compromise. The human eye is so well designed and adaptable that camera lenses just can’t match it! I agree perhaps two cameras is a good approach to take. I have tried carrying two DSLRs in the past when taking photos at events but i’ve found this quite cumbersome. So maybe a Ricoh GR would be a good backup camera? Have you read Spyros’ review of the GR? In fact he says just that about it being a great backup camera! http://www.streethunters.net/blog/2015/02/05/ricoh-gr-street-photography/ I just wish the Ricoh had an OVF! And I’d like to be able to change lenses really too. As for focal length tips, I hope to be publishing an in-depth review of several of my lenses in the future, so please look out for that! I keep the 50mm on my 6D most of the time now, but I also carry the 16-35, and this is actually my favourite focal length and lens, but it’s so intimidating for passersby. I also have a Tamron 24-70 which is a nice lens, but a zoom lens like this is a little difficult for street photography, as the temptation is just to use it at full zoom which I find results in photos that don’t have that immersive ‘feel’. Anyway I hope you enjoy the lens reviews when they are eventually posted and written. A wide-zoom can be very helpful, like the new Tamron 15-30mm f/2.8 VC — to counter our fear, as it allows for pointing sideways. I’m still working on ‘the fear’, I feel it’s what’s really holding me back at the moment. I won’t sell my 6D ever, or i would upgrade it with another 6D Mark II in future, though i may buy 2nd Body like the 5Ds R + 11-24mm f/4 L (most challenging lens ever), and attaching a tele-prime like 135mm f/2 or 100mm f/2 on 6D ; and a fast 50mm f/1.2 or 1.4 (upgrade awaited for both lenses, probably coming in the 1st quarter of next year) as the 3rd lens (in the bag) to fill the space between them both. Huh, i would go nuts if i continue like this. I know all this sounds like crazy… but GAS (gear acquiring syndrome) is the worst disorder the photographer suffers from. We can cure it to become GAS (gear Avoidance syndrome). If we could buy all equipment in the world, such a scenario where we have to choose, can be kept at bay. I will weigh all my options before i would dive deep into the bottomless sea of photography. Also, DxO Mark Ratings can’t be followed, as, it may show technical image quality of a lens tested in Lab conditions, which are good reference for a Studio Shooter, not for on-Field, on-Site outdoor shooter. DxO don’t show us the Colors, Pop, 3D-feel or Separation (sense of Depth), quality of Bokeh, etc.. i.e. the Unique Typical Character of that particular lens. So going solely by that website is not a remedy. Yes Chirag, with cameras sometimes less really is more! Especially when you think that photography masters like Bresson were using equipment that whilst very high quality, we’d see as quite basic now. And I agree with your point about choosing gear based on studio tests and numbers, I think it’s much more important to test equipment yourself and see if it works for you. Photography is very subjective after all. Thanks for your detailed comments! yes, Heni Cartier-Bresson used just one 50mm f/2 Summicron Lens for 3-4 decades on his Leica II & III before he went back to painting, like he was earlier too, before he started his Life Reportage Style of Photography, and was known as the Father of Photojournalism. Yes, his gear would appear very basic to us. Thanks for the 2 links you shared, they are helpful. yes also, i would be keeping an eye on your upcoming reviews. I’ve had my 6D for about three years, and it is my vacation and event camera. For street I use the outstanding Leica M-E and M Monochrom (first version) with 35 and 50mm f/1.4 Summilux lenses. Nothing comes close to the Leicas for street, but when traveling with my 6D it does better than it should. My favorite lens is the 35/1:4 L II, which is fast enough and sharp enough for 85% of the images I would want to capture. I also own the 24-105/4 L zoom, but on my last two trips it stayed in the bag. Next trip, it will stay home.